We have launched a brand new throw cushion collection of SIX of our latest designs. 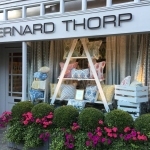 Cushions are available in two sizes and FIVE exclusive Bernard Thorp custom colours for Autumn/Winter 16. All hand screen printed and made in London.